Snails leave behind slime as they This slime is a powerful form of suction which enables them to move upside down, around corners, and assume comical positions. Moving is inherent in our lives. We move when we resign from our current job, transfer to another company, occupy a new house, bid goodbye to colleagues or friends after a group travel, graduate from high school or college, transfer to another school, leave a community after project completion, and so forth. As we move, we humans are also leaving something behind us, like the snail. Have you realized that whenever you are new to a place or to your work, your new colleagues would always tell you something about your predecessor or about the people who had left or had resigned from the company that hired you? I think this is natural. You cannot blame or stop your colleagues from sharing stories, good or bad, about those people who were with the company before you. This is not an act of gossip. This is an act of informal post social evaluation. The reality is that we are evaluated, more often than not, after we have moved out of a place or work. I know you would say, “So what? I don’t care about what that they would say about me. I would not see them anymore anyway.” These are normal reactions by many of us. However, once we reflected on the implications of what our former colleagues would say about us after we left a job, we would start to care about what we should leave behind every time we move. Why? Because that general opinion of others about us especially after we have left an organization or a company is our reputation. Reputation is commonly defined as an opinion about an entity. It is typically the result of some social evaluation on a set of criteria. It may be considered as a component of our identity as defined by others. I believe, and I think you would agree, that a good reputation is one of our best assets. For Dr. Alex Lickerman, the founder of happinessinthisworld.com, our reputation is a tool for practical navigation through daily life. Last year, I met two “head hunters” on different occasions. They both presented me with job opportunities in recognized mining companies. Though I was not looking for a job at that time, I accepted each of their invitations for a meeting. After discussing their company profiles, they informed me that my former colleagues referred me to them. I would have felt I was the luckiest man in the world at that time if I were desperately looking for job at that very moment. Two key lessons could be drawn from this experience. One, the hiring strategy of big companies had changed drastically over the course of time. The use of head hunters is now popular among companies. These head hunters’ task is to find the right people for a job. To facilitate their search, head hunters look for people who could refer or recommend potential candidates, instead of advertising the jobs and screening tons of resumes. Second, since the “referral system” is now the rule, would it be nice to think that we should have references everywhere? When we leave a good reputation every time we move, companies will look for us, instead of us looking for them. Colleagues and clients who had pleasant experiences working with us would be very generous with their words about us. That is why it is important for us to do our best at each step of our career. One good thing surely leads to another. Leaving behind an excellent reputation is tantamount to expanding our world, and thus, widening our opportunities. If we left our job but have a good reputation, we have a 99% chance that another good job offer will come knocking right at our door steps. We need not look hard and long. If you think that those persons you have worked with before will have no relationship with you in the future once you cut your ties with them, you should think again. There is a reality in our lives which is known as “six degrees of separation.” This refers to the idea that everyone is, on average, approximately six steps away from us by way of introduction from any other person on Earth. Because of this, a chain of “a friend of a friend” statement can be made, on average, to connect any two people in six steps or fewer. We will never really know if the third person next to us in the office or cubicle is a sister or a friend or a wife or a daughter of anyone of those we have worked with before. If we knew, we wish we had done them well. And we would be careful as to what we were leaving behind. Like the snail, the slime in our life is our reputation. Once we are able to establish a good reputation, we can move upside down and around corners, and the best things in life will always follow. So, always be careful to leave something good behind. It’s The Snail, John! is an attempt to help you look back from as well as forward to your life. The author discussed 5 simple lessons that can guide each of us to stir success and happiness straight to our own doorsteps. How to discover the right career path and be successful? How to live a life and be just happy? These are John’s questions a year ago. Confused and feeling lost, he turned to his former High school Social Studies Teacher in the hope to be enlightened. The questions stimulated John’s former teacher to start an account of his life’s journey and of those people whom he met and worked with. After putting together all the lessons he uncovered (from his and other people’s lives), the teacher suddenly had a dilemma on how he could present it to John in a way that would tickle John’s imagination and trigger his interest to do his own reflection. Thanks to the unruffled snail! Yes, a snail! 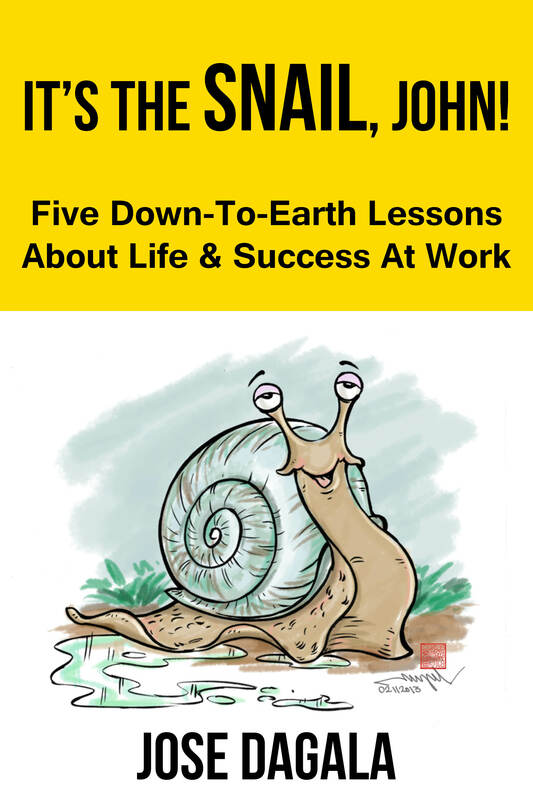 The teacher had found out that the lessons he wanted to share with John and alike about life and success at work were hidden beneath the intriguing characteristics of snails that he saw and observed closely one morning at the garden of his office. 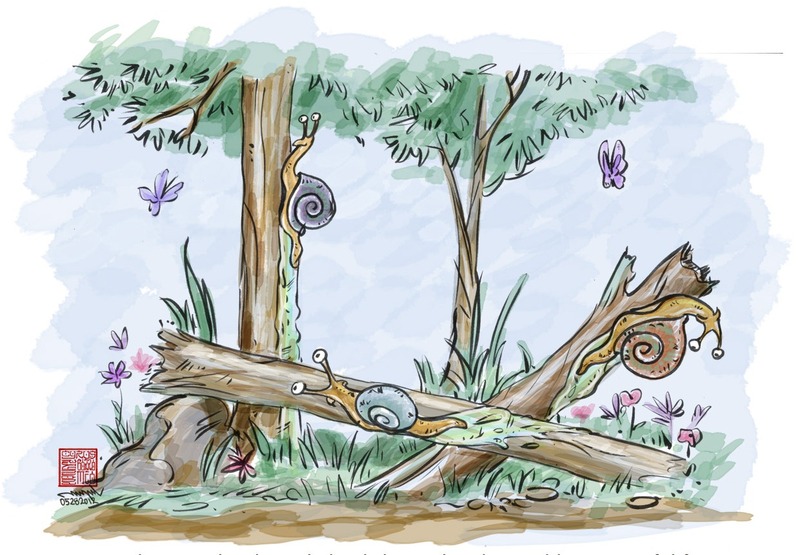 The life lessons that this book aims to teach its readers revolve around the snail and its five characteristics which the author found from his research. As he ventured deep into the comparisons, he discovered the “parallelism between the life of a snail and that of a human being searching for success” to be simply amazing. After reading It’s The Snail, John! like the snail, you will realize that true success and real happiness lie within you. So, just move and grow the snail in you!